As both a Canadian and a pipe lover, it is perhaps inevitable that I hold a special place in my heart for Canadian-made pipes, especially those produced by Brigham Pipes, one of the country’s oldest pipe-makers, and one that has survived two World Wars, the Great Depression, countless lesser economic upheavals, and the more recent and radical cultural shift away from tobacco use. 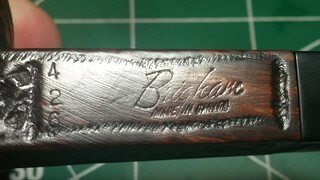 I have dozens of vintage Brigham pipes in my personal collection, and over time I have developed some fluency for identifying and dating the various examples of briarwork, both pedestrian and remarkable, with which I have been fortunate to become acquainted. My goal here is to present, as clearly as possible, a concise guide to decoding the stamps, markings and other features of Brigham pipes over seven distinct periods of production. Data for this project has been gleaned from many sources, including, but not limited to, the “official” (if scant and sometimes confusing) Brigham history published on the company’s website, other online resources such as pipe logo and markings site Pipephil.eu , forum posts by other Brigham enthusiasts, and, where available, vintage catalogs and firsthand examination. If there are flaws or faults in the information presented below, I assume all responsibility and would be thrilled to receive expert correction from confirmed and documented sources. EDIT: In April of 2017, I received an email from Daniel More, President of Brigham Enterprises Inc, with his input on this paper, which I have incorporated into the information presented below. The Pre-Patent Era (1906 -1937) covers the early decades between the company’s start and the invention of the now-famous Brigham Rock Maple filter system. There is almost no literature available from this period and stampings or other identifying features are unknown, though presumably the Brigham name was stamped on the pipes somehow. If you have an old, non-system Brigham pipe in your collection, it may well hail from this time period, though a few non-filtered Brigham pipes were produced over the years, up until the late 1990s. The Patent Era (1938-1955) is the best documented period of the company’s history, and some would say its heyday. 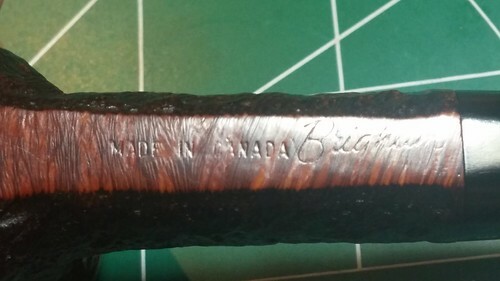 Pipes from this period are stamped with “CAN PAT 372982” (the Canadian Patent number for the Rock maple filter system), the Brigham thin-script logo and a 3-digit shape number. The patent on the Brigham filter system expired in 1955, ushering in the Post-Patent Era (1956 – roughly 1969). The “CAN PAT” stamp was replaced by a “Made in Canada” stamp in block letters. The 1960s saw the introduction of new product lines, including the Norsemen and Valhalla series of rusticated and smooth (respectively) freehand-style pipes created to capitalize on the growing demand for Danish pipe shapes. Around the late 1960s or early 1970s, at the beginning of what I’ve called the Canadian Era (roughly 1970 – 1980), the stampings changed again as Brigham moved to modernize its logo. 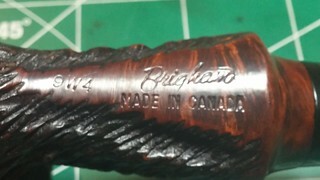 Pipes are stamped with the 3-digit shape number and “Brigham” over “Made in Canada”. Note these two variants of this stamping. I have dubbed the decades between 1980 and 2000 the Late Canadian Era, a period that saw several changes at Brigham that are of note to the collector. First, the traditional 8-grade pinning system (the famous Brigham “Dots” which denoted the quality of the pipe) was changed to a 7-grade system to simplify pinning (more on this below), and the Norsemen and Valhalla series were merged to form the President Series, which represented the very finest pipes coming out of the Toronto factory. 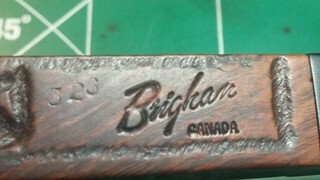 Early pipes from this era (left, below) are stamped with a shape number and “Brigham” over “Canada”; later pipes (late 1980s+, on right below) are stamped simply with a shape number and the Brigham logo. The Transition Era (2001 – 2006). The biggest change to hit Brigham since the advent of the Rock Maple filter occurred in 2001 when Brigham moved production from Toronto to Italy. The product lineup was, not surprisingly, heavily impacted, with the most obvious change a sharp decrease in the number of pipe shapes available. “Admittedly the hardest decision we ever needed to make. With an aging skilled work force we were losing the skills required at an alarming rate. We made attempts to bring in new people but we were not effective in staving off the atrophy. We were fortunate though to be able to move by increments allowing us control and comfort throughout the process. For example, instead of turning our own bowls we began to purchase turned bowls; then we had stems added with sanding at 100-grit ; then sanding to finer degrees; then staining and so on. The last bit of control was grading. “Principally there were two catalysts for the change. We were using a very specific OD for our Aluminum Tenons. In fact, we were one of only two companies in North America using this OD, the other being an aircraft manufacturer in California. When this aircraft company shifted to an alternative, it left us and us alone purchasing this specific size. To stay with Aluminum, our only alternative was to purchase an oversized OD and tool this down to our requirements results in significant expense due to the wasted material costs. We had, for many years, experimented with a number of composite materials for both the tenons and Distillator Tips. The issue was always heat resistance. Technology having advanced as it did by the 1990’s presented us with a selection of alternatives. We tested 10 different compositions before landing on the formula we still use today. pipes and continued to be recognized by their traditional brass pin patterns. These lower series pipes were offered in 9 shapes.The 400 series disappeared temporarily, while the 500 to 700 series pipes, available in only 8 shapes, lost their brass pins and were identified only by their 3-digit shape numbers. 500 series pipes were fully or partially rusticated, the 600 series featured a larger proportion of smooth finish, and the 700 series were fully smooth, made from near-flawless briar without fills or rustication. 500-700 series pipes from this period were fitted with a silver (nickel?) band with the Brigham leaf logo and a choice of acrylic stem in either black or green marble. honouring Canadian history and heritage. Pipes in this latest series feature a factory bowl coating and are available in 12 shapes. 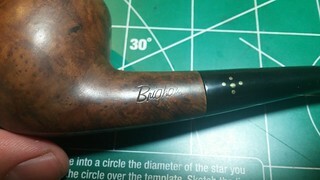 The answer can be found in Brigham catalogs of the period, like this one, circa 1960s, posted on RebornPipes.com. The vertical and horizontal 3 Dot pipes sold at considerably lower prices than the 600 series, 6 Dot pipes, and should therefore be considered unique quality levels despite the 6xx shape numbers attributed to them. In the late 1960’s and 1970’s, Brigham was working on revising its grading system to simplify pin configurations and reduce consumer confusion around the multiple 3-Dot configurations. During this transitional time, the product line was reduced, dropping several of the original grades. The progression, found below in the 1975 Brigham catalog, shows 1 through 4-Dot grades, followed by Special Grain (stamped with the old VIP Horizontal 3-Dot pins) and Select Grain (pinned as a 5-Dot). In the late 1960s and 1970s, the Brigham Norsemen and Valhalla series of larger, Scandinavian-inspired pipe shapes carried their own configuration of Dots. These two series shared the same 6 shapes. The Norsemen were fully rusticated and pinned with the old Brigham VIP 3 Dot horizontally aligned pattern, with the middle Dot larger than the other two. They were stamped with “9Wx”, where “x” indicated the shape number (2 through 7). The Valhalla series of smooth or partially rusticated pipes were available in three grades, A, B and C, with C being the highest grade. A Valhalla pipe in Shape 6 could therefore be stamped “AV6”, “BV6” or “CV6” depending on grade. Dot patterns on the stem ranged from 4 dots (A grade) to 6 Dots (C grade). 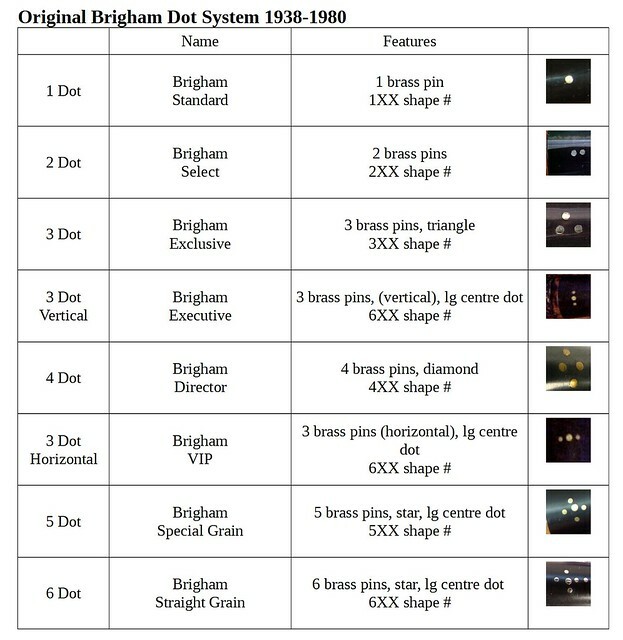 Brigham changed the Dot system in 1980, adding a 7 Dot at the top of the line, dropping the names of each series and eliminating the confusing vertical and horizontal 3 Dot configurations. 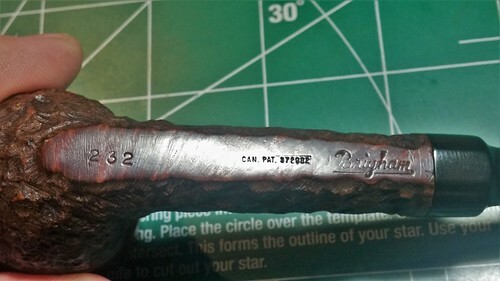 The Norsemen and Valhalla series were combined to form the President series of freehand pipes, which adopted a 3 Dot pattern with a larger dot on the right as shown below. The 7- grade pinning system stayed in place from 1980 to 2001. Other Series Brigham System Pipes (late 1990s to early 2000s) were the first Brigham pipes to be made in Italy. These were entry-level pipes marked first with a yellow star on the stem, which changed after 2001 to a leaf. 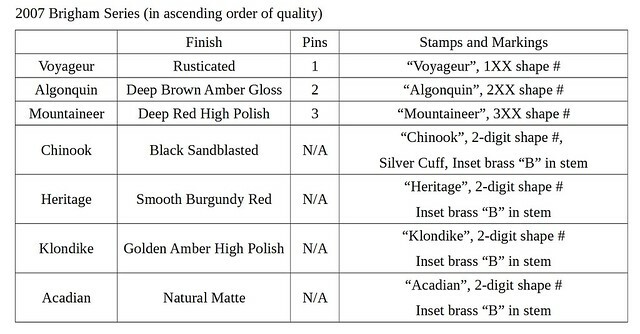 Except for the lowest three grades, pipes in the current (2007) Brigham series cannot be identified by brass pins or shape availability. All grades are available in 12 standard shapes, but are distinguished by their unique finishes and markings. As noted above, the Voyageur, Algonquin and Mountaineer pipes are made in Italy, while the remaining pipes in this series (Chinook, Heritage, Klondike and Acadian) are produced in France. though the brass pins are gone, replaced with the now ubiquitous Brigham “B” logo in a circle, set into the top of the acrylic stem. The modern series is based on Scandinavian shapes that Herb Brigham enjoyed the most, in a variety of finishes named after “executive places” – locations you’d expect to find a CEO or company executive, including “Boardroom”, “Muskoka”, “The Country Club”, and “The Helm”. Not content to rest on their laurels, Brigham has recently introduced a new range of pipes, the Giante Series. As the name implies, these pipes are larger, designed to provide a longer smoke from a single bowl. They are available in three traditional shapes (Bent (Egg), Semi-Bent (Brandy) and Straight (Billiard)) and in either a reddish-brown smooth or black sandblast finish. All of them come with the Brigham Rock Maple filter system. As you can see by the variations in stamps even within the same general period, it can be tricky to nail down the exact production time-frame for a given pipe. Vintage pipe catalogs and other company literature can be of great value in establishing a production timeline for a particular pipe, though this is not always foolproof. I own several old Brigham catalogs, but none of them are dated – another unfortunate custom of the day shared by many makers until the mid to late 1970s. Incomplete information and undated literature are part and parcel of the pipe collecting hobby, and though it can be frustrating at times, the thrill of discovering a new pipe shape or finish variation more than makes up for any initial inconvenience in identifying that new acquisition. I hope this little treatise on Brigham pipes proves a useful resource for the identification and dating of pipes in your collection, or perhaps those you might wish to consider for a vacant space in your pipe rack. I’ll now open the floor to you for comments or corrections. I would especially welcome any high-resolution digital copies of Brigham literature that would help verify or expand information in this paper. Thanks for joining me on this little 110 year trip. Until next time, Happy Piping! Another well written, easy to follow guide. I’m imagining eBay prices will go up 25% after others read this. Thanks for the info, Charles. I too was thinking of looking at a Brigham or two on eBay, but also thought the prices will be increased after this gets out and into the blogosphere. As usual, a superbly written and informative guide, Charles. I’m sure we all will be bookmarking this. Thanks Al. I don’t think the market is going to spike any time soon. 😀 But at least folks will know what’s being peddled to them. That won’t make rare pipes more common or cheap pipes worth more; we’ll just be better informed. We never know when a brand becomes very collectible. I had gotten into Custom-Bilts and paid dearly when there was a frenzy for them. I also managed to sell some for more than I purchased them. Sometimes, it’s impossible to keep a secret. This is a helpful addition to the historical information available on Brigham pipes. Well written and well researched Charles! Thanks Steve. I got tired of finding bits and pieces of info here and there so I thought I’d bring it all together in one place for ease of access.